Where are you willing to go on vacation in order to have cool selfies to post on social media? Or perhaps more accurately, what kind of unusual lodging are you willing to bunk in, in order to secure those all important social media bragging rights? It seems the answer to that question continues to expand, as social media's influence on our lives becomes increasingly omnipresent. The latest example is the proliferation of bizarre and unusual accommodations being offered on websites ranging from Airbnb, to BnBFinder.com to HomeExchange.com. Everything from treehouses to tepees and train cabooses are becoming commonplace on such sites. What's more, even small mom and pop vacation destinations are getting in on the action. And really, why book a staid hotel room for a vacation, when you could instead be posting pics on Facebook or Snapchat while lounging in an igloo or hobbit house? "We have treehouses, lighthouses, railroad cars...there's a school house on our site, and there's churches," says Mary White, BnBFinder.com's CEO and founder. "In my opinion, these things are popular because of social media, which allows us to share everything, and that spreads the word about these things so much faster... It used to be that if you stayed in one of these places, only your closest friends would know. But my friends on social media, tangentially, are in the hundreds of thousands of people, and now they all know." BnBFinder lists dozens of accommodations that go far beyond your basic guest room. In the Shenandoah Valley for example, travelers can opt to sleep among the birds in a luxury tree house cabin at the Iris Inn. The cabins include oversized porches with hot tubs, opulent bathrooms with rainwater showers for two, heated tile floors and full-size kitchens. Who knew all of that could be squeezed into a treehouse? Lighthouses are another quickly growing segment on the site, so much so that BnBFinder created a special category devoted to searching just these listings. Although there are not that many lighthouses available to stay in, there are a lot of travelers who are into adding to their list of lighthouse overnights, continues White. Among the noteworthy lighthouses that can be rented through BnBFnder is the East Brother Light Station, outside of San Francisco. The property was a working lighthouse for 42 years and has been a bed and breakfast for the past 35 years. Perhaps far more unusual among the site's 2,000 listings is the monolithic dome for rent outside of Chicago. Known as the "Thyme for Bed" property, it was built by an engineer who was seeking to create a safe refuge for his family, to protect them from natural disasters. Far from being a sparse storm shelter, the dome includes flat screen televisions, WiFi, fireplaces and a whirlpool tub. "I love this industry, because of all of the unique accommodations," says White, of the bed and breakfast business. "Because they don't have a directive from corporate, they can really be creative in their offerings and can share their passion, whatever it may be." Yet another avenue to consider if you're in search of the unusual is HomeExchange.com. As it's name implies, it's not a site that lists hotels, but rather is a home exchange club with properties around the world. The site has upwards of 65,000 listings throughout more than 150 countries and among the offerings are castles, coffee farms and, of course, treehouses. Participating in Home Exchange involves paying a $150 annual membership and also listing a property on the site for the occasional exchange (whether it be a second home, your primary home, or perhaps an apartment you rent for the apartment dwellers out there.) The possibilities of what can be listed for exchange are limitless. 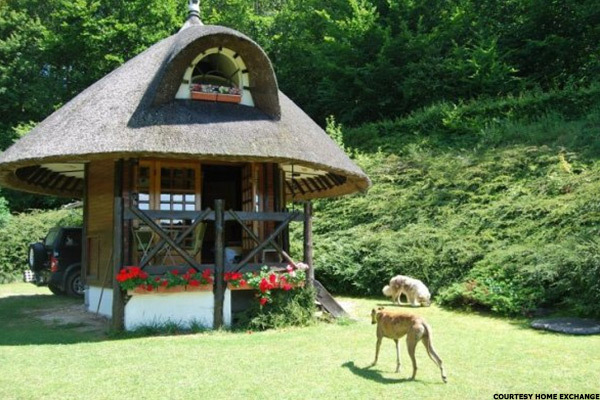 "We have one home that we call the hobbit home that sort of looks like a yurt or a giant mushroom," says Jim Pickell, president of HomeExchange.com. "We have lots and lots of architecturally unique homes. We're not talking Dwell magazine types of homes, but homes like the seven dwarfs home, the hobbit home and treehouses in the rainforest." The site also includes monastery retreats, yurts, and homes on private islands. "Home exchangers are more progressive thinking," says Pickell. "They are the people who are willing to try new things, and that includes where and how they live. They want to experience other types of homes." No money changes hands through the site. The homeowners or renters who are members work out the details of each exchange themselves, whether that be a simultaneous home swap or reserving a property for just a weekend or as long as a year. Not to be outdone by all the unique listings popping up on major travel sites, small property owners and vacation retreats around the world are also venturing into the quirky accommodation business. One such example is Entre Cielos Luxury Wine Hotel + Spa in Mendoza, Argentina, owned by Cecile Adam. Located on a sprawling vineyard, the hotel oozes charm and luxury. 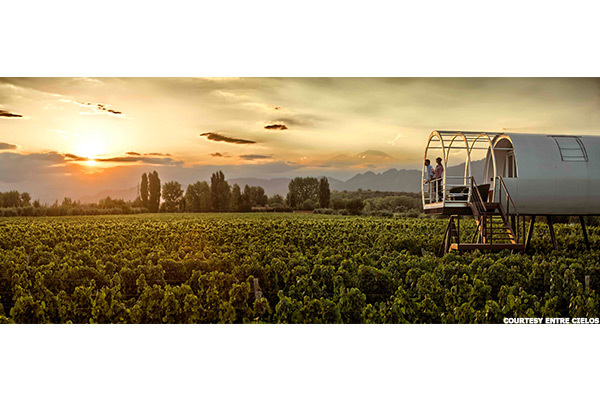 But one of its most distinguishing factors is its Vineyard Loft room, a pod-like creation that hovers about 30 feet above eight acres of Malbec grapes. The 376-square-foot, futuristic pod includes a bathtub on its outdoor terrace and windows in the ceiling that provide an outstanding view of the night sky. "Guests love the idea of floating above vineyards and the unusual experience," says Adam. "You have a nice view of the hotel, it's private, unique, and everything is round and all of the material are white. It really attracts people who are bored of luxury, or who just want to have a special experience that they wouldn't have at home...It's really for someone who likes to be connected with nature and with the sky." On the other end of the spectrum are the two 1930s train caboose accommodations that will soon be offered at Buffalo Creek Vacations in North Carolina. Purchased by the property owners about a year ago, the cabooses are undergoing extensive interior renovations in order to make them a cozy retreat for guests. About 300 square feet each, they sleep four people and include a full kitchen, bathroom and two sleeping areas, one in the cupola (ideal for children) and another full-size bed. "You can lay in bed in the caboose and look out the window and see our buffalo herd," says owner Cheryl Hillis. A 65-acre property in the Smokey Mountains, Buffalo Creek is home to buffalo, llamas, miniature ponies and goats. And now the property's collection of unique and unusual offerings includes two historic cabooses, which will be available for rent starting in March. "We're the first caboose lodging in North Carolina," says Hillis. "Most kids love trains and animals, so this is a great place for families to reconnect, get kids off of the electronic games and enjoy what it was like in the olden days."